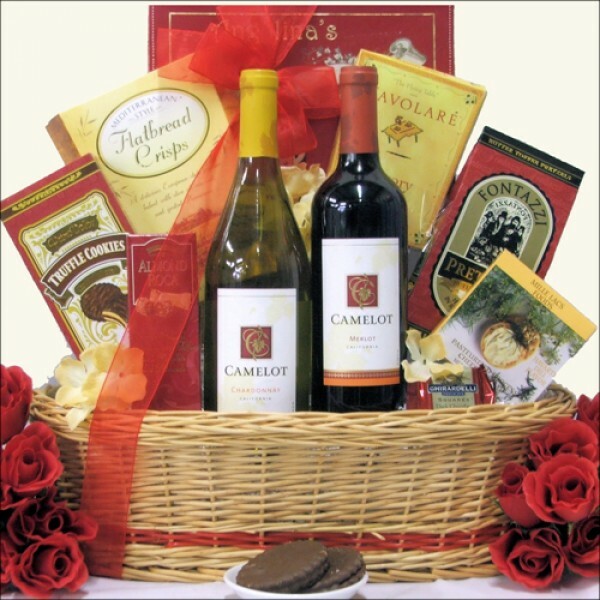 They are going to love to receive this bright and cheery two bottle gourmet wine gift basket for any occasion. The Camelot Duet wine basket features Camelot Chardonnay white wine and Camelot Merlot red wine from the Lodi, Central Coast and Northern coastal regions of California. Paired with these easy drinking wines are some delicious gourmet treats including Havarti Dill Flavored Cheese Spread, Mediterranean Style Flatbread Crisps, Ghirardelli Chocolate, cookies, snacks and more. A great gift to let them know you are thinking of them. ...in an Oval Willow Honey Stained Boat Shaped Gift Basket with Red Trim.